by Stacey Mia and Mary Ann Lackovich. August 28 - September 04, 2011. The Assyrian flag is shown third from the left, represented and standing behind it are the great Assyrian poets, Ninos Aho and Yosip bet Yosip. Editors' Note: These additional photographs courtesy of Dr. Dariusz Pacak, a poet friend from Vienna Austria to Ninos Aho, Yosip bet Yosip and the Assyrian community. Both Ninos and Yosip had "Occupied Assyria" symbolically written on their name badges, placed right on their hearts. The sun rose over Lake Michigan, like a shining beacon over the City of Kenosha on August 29, 2011. The World Congress of Poets, under the auspices of the World Academy of Arts and Culture (UNESCO) convened for the 31st time in over 40 years in the small Midwestern city, once named Pikes Creek and Southport, Wisconsin. Carthage College on Lake Michigan offered their A.F. Siebert Chapel for our Opening Conference and its facilities for the first day’s activities. 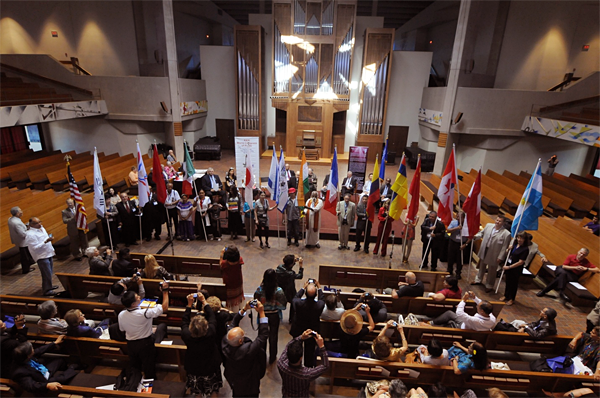 The Parade of Nations opened the Conference with all the participant nations processing into the Chapel including Argentina, Austria, Canada, Chile, China, Colombia, Ecuador, France, Ho-Chunk Nation, India, Israel, Japan, Mexico, Morocco,Occupied Assyria, Spain, South Korea, Venezuela, and the United States of America. The theme song “The Shining City on A Hill,” performed and arranged by the Grammy Award winning The King’s Singers (UK), was played during the procession. 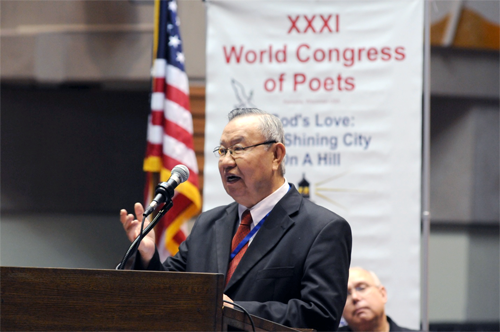 Dr. William P. Schmitt, Vice President of the 31st WCP, proclaimed the nations. During the Conference speeches were delivered by the Honorable Keith Bosman, Mayor of the City of Kenosha, State Representative John Steinbrink of the 65th District of Wisconsin, George Tsorgas, Executive Director of the Wisconsin Arts Board, Dr. Maurus Young, Dr. Ernesto Kahan, 1st Vice President of the World Academy and Dr. Mary Ann Lackovich, President of the 31st World Congress. Honorary Doctorate Degrees of Literature were given to Carlos Hugo Garrido Chalen (Peru), Bella Clara Ventura (Colombia), Yang Keum-seon (South Korea), Darius Pacak (Austria). Honorary Doctorate Degrees of Humanities were bestowed upon Keith Bosman, Mayor of the City of Kenosha, Leo Grillo, Founder of D.E.L.T.A. ; Ron Robinson, President of Young America’s Foundation; and Eduardo Verastegui, Actor and Pro-Life Champion. Presidential Medals honored Stacey D.K. Mia (USA), Kae Morii (Japan), Patricia Garza Soberanis (Mexico) and Rosalba de la Cruz (Mexico). 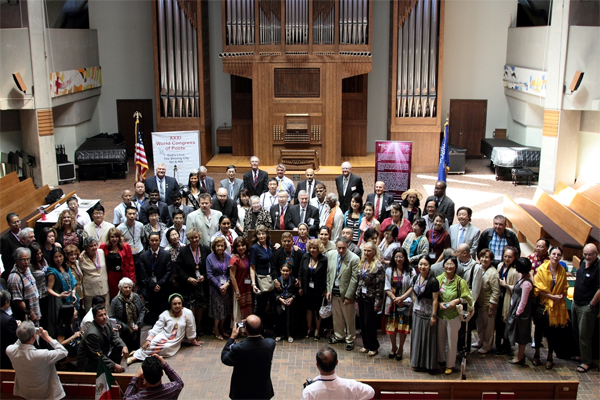 A Cultural Art Exchange, the first of its kind in the WCP history, was presented and accepted from China, Japan and the United States. 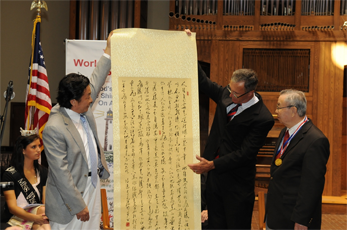 Dr. Yu Liansheng, one of the most prestigious calligraphers in China, and eight other Chinese calligraphers brought their artwork to present to the City of Kenosha. 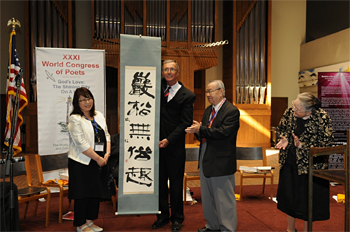 Madame Toshie Tai of Japan offered her calligraphy to the City. Mayor Bosman and Judy Russow, on behalf of Kenosha’s own Pollard Family, presented the artwork of George and Nan Pollard to China and Japan in return. Loretta Grabske, watercolor artist, of Watertown, Wisconsin presented eleven original paintings as gifts on behalf of the State of Wisconsin.